ARRB will help train India’s bridge inspectors under a new agreement between the National Transport Research Organisation and a leading Indian engineering consultancy. IDDC Engineers Pvt. Ltd and the various Indian Bridge Management Systems (IBMS) will use ARRB’s asset management experts to help bridge inspectors understand the correct procedure of inspection (What, When and How to Inspect). They will undergo two-day training courses for Bridge Inventory and Bridge Inspection. Over 400 bridge inventory and inspection engineers working on various state and national IBMS will benefit from such training. 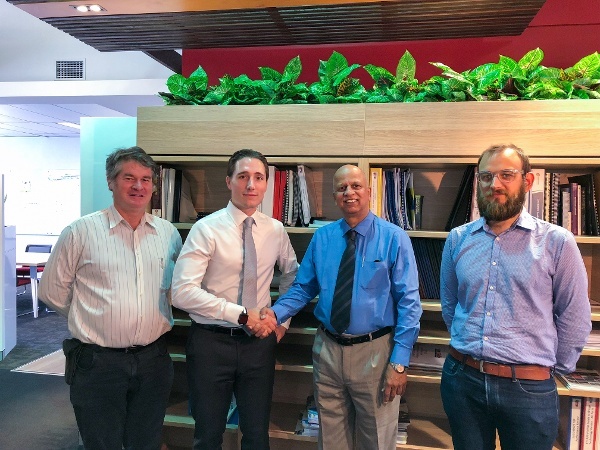 ARRB's Queensland State Technical Leader Matthew Bereni signed the agreement with IDDC's bridge management team leader Sachin Joshi, with ARRB's Future Transport Infrastructure team members and bridge specialists Tim Heldt and Josh Seskis watching on. Tim and Josh are among ARRB's presenters at our regular Bridge Inspection Workshops run throughout Australia.